Kazakh Soviet actor and film director. People's Artist of the USSR. Member of the CPSU (b) since 1940. 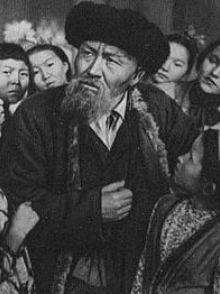 Shaken Aimanov born 2 (15) February 1914 in Bayan-Aul (now - Pavlodar region of Kazakhstan). In 1928 he graduated from high school. In 1931-1933 he studied at the Kazakh Institute of Education in Semipalatinsk. In 1933 he arrived in Alma-Ata, and he joined the Kazakh Drama Theater in 1947-1951 - chief director of the theater. During his work in the theater showed acting, which was characterized by the brightness of the psychological characteristics. Among his best roles Akan Seri ("Akan Seri - Aktokty" GM Musrepov) Koblandy ("Karakipchak Koblandy" MOAuezov) Kazantsev ("Night rumblings" MOAuezov), Tikhon ("The Storm" by Alexander Ostrovsky), Ivan Shadrin ("The Man with the Gun" NFPogodin), Petruchio ("The Taming of the Shrew" by William Shakespeare), Othello ("Othello" by William Shakespeare).